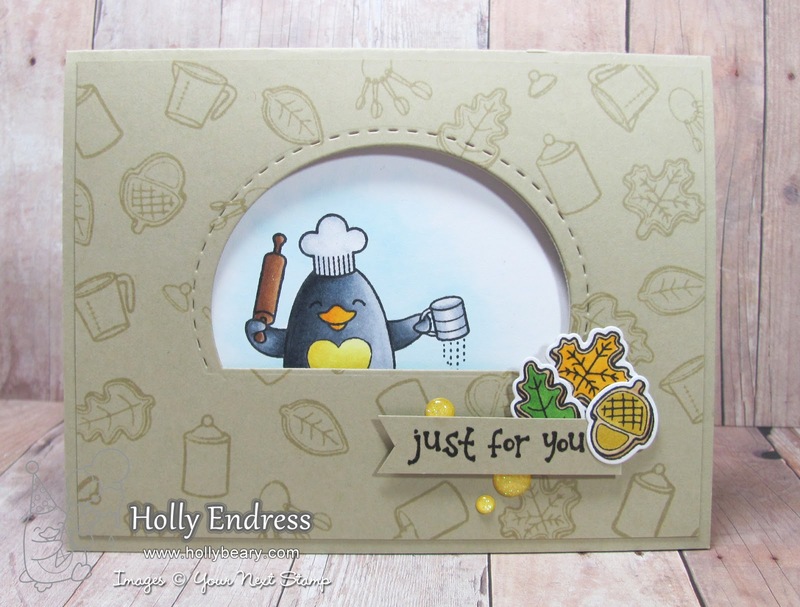 Hollybeary Creations : YNS New Release Blog Hop!!! YNS New Release Blog Hop!!! Yay it's time for the Your Next Stamp New Release Blog Hop!!! 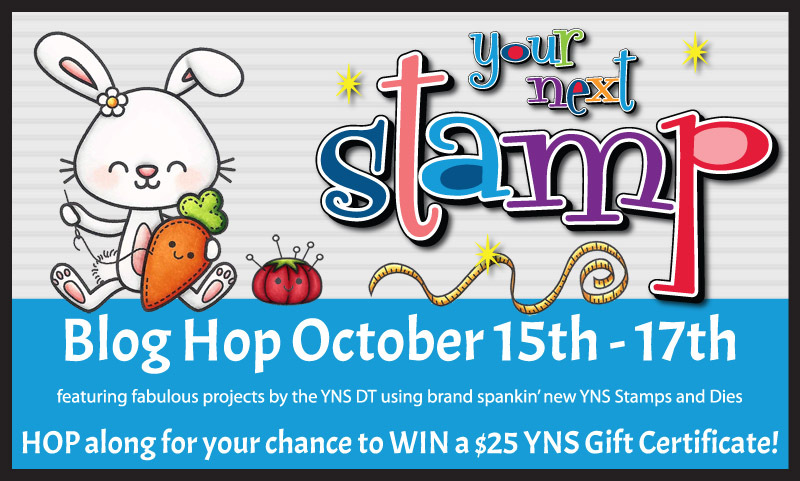 Hop along with us and leave comments for a Chance to win a $25 GC to the YNS Store. This release is Fantastic.. so many cute sets and new Waddles!!! We all know how much I love the Waddles!! My first card using the leaves from the new set Sandy Autumn Greetings. I stamped the leaves randomly on a piece of Watercolor paper and colored them in with my Zig Clean Color Brush pens. I added the panel to a Kraft card base then I rounded the bottom edges. I die cut a Banner using the same Kraft card stock and added the Fancy Thanks Die.. I cut it from a piece of Fall Friends paper from Doodlebug Designs. I added a drop shadow by cutting a second one from Chocolate Chip card stock. My second card using one of the new Waddles.. This is Waddles Handmade with Love and the coordinating dies. I also used the Peek a Boo die as well. I stamped the Cookie leaves all over the background and adhered the panel to a Kraft card base. I die cut the window and added the sentiment and a few of the cookies that I colored in. I also added a few of the new Give Thanks for Sparkles Gumdrops.. you are going to love these, they are gorgeous in person! On the inside of the card I added a white panel and stamped the penguin image and colored it in with Copics. I left the sentiment off so you could make it for the specific occasion you needed it for. This is such a fun set with the Peek a Boo die. Okay are you ready to get Hopping? Hop along below and be sure to leave comments and you will be entered for a chance to win a $25 GC to the YNS store. And done't forget to grab your sets with the sale code above!! Love that baker penguin, so adorable and how beautiful is your autumn creation on craft, love them! Each of your cards has such great backgrounds - I like that you created each. The leaf card is so pretty and colorful! Love the leaf background! I just did a similar one as the background on a fall wedding invitation. Lovely! Holly, I love the peek a boo die and this little penguin is just adorable! Ooo - the thanks card is gorgeous. Love the watercoloring! Love the bright colours on your thank you card. Waddles baking makes me smile. The coloring on the leaf card is beautiful. Love how the chef is highlighted through the cutout. card with the scene inside! Pretty leaf card! 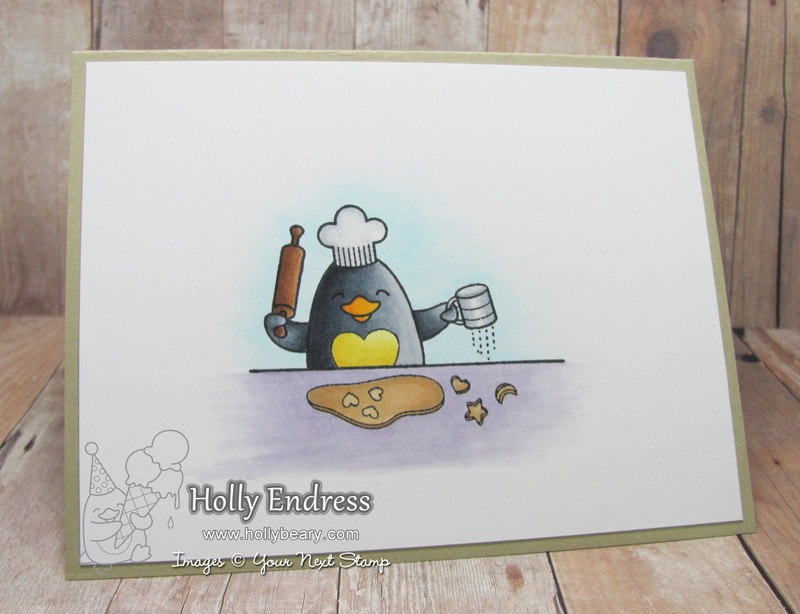 And I love the little baking penguin! Great job! Such sweet creations here! The leaves are lovely, and the baking penguins? Seriously cute...very seriously! 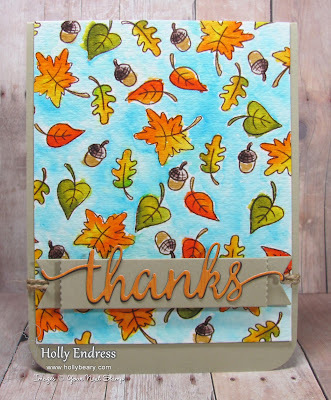 Beautiful cards, love your fall leaves card. I also love waddles too!! Holly your cards are just so sweet. I adore Waddles he is so fun and always can bring a smile to ones face! I'm just loving your designs! Two very different and very awesome cards! Sweet cards. I like the leaf background. Love the stamped backgrounds! Darling cards! Great cards. Love the blue background looks like it was tons of work. Great cards! Great backgrounds/patterns using the stamps! Awesome, I just love these cute little cooking and baking penguins! I like the fall colors on the first and the window on the second. Love your waddles card! The other is cute too! Love the leave background! The colors are perfect! Thanks for sharing!! These are so adorable! Love the leaves; beautiful! And that second card is super cute. Love the layout.